Making fun of your mother’s technological naivete is the lowest form of humor. But I’ve never claimed to be high-brow. 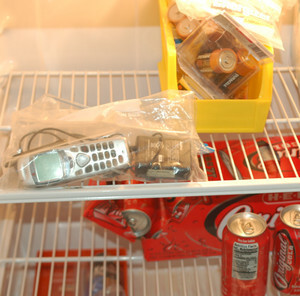 So not only does my mom, Susan Jacobson, still think it’s a great idea to refrigerate batteries, she also believes she should preserve her old cellphone there. And its power supply. Mom loved her old cellphone. I think she purchased it just slightly after Queen Elizabeth’s coronation. But that sucker just wouldn’t break. When the phone was about 10 years old, it needed a new battery, so she took it to the store and the young man behind the counter, well, he laughed at her. And when he disappeared behind the door, we can only imagine what he told his pimply little friends back there. Fast forward to about 2011, when Mom wanted something just slightly smarter so she could get email. Whatever she got, she hated it. I mean, this is the lady who labels her router “router” so she knows what it is when tech support tells her to unplug the router (pic below). Anyway, she hates the new phone and wants the other one back, so she takes them both back to the store and the kid – the one who laughed at her – said no can do. They can’t recommission that old thing (the phone, that is). It’s no longer supported. Surely one day they will find the technology to revive the phone.